MOPS Convention… so….about the kids…..will they make it, without me? I spent hours making and freezing healthy casseroles and filling notebooks with instructions for my husband. (And who ever else was caring for the kids. Sometimes it took some fancy scheduling to make it to convention!) I included a phonetic dictionary of preschooler terms: nana= blanket, sneezus= Jesus and usually meant he way praying….etc. I wanted to make sure communication would continue without my mom-terperative skills. I left a list of places to find things to avoid the inevitable call to ask “Where are my clean underwear, and do you know where the kids shoes are?” Being inevitable, the calls still came. (Funny how that works, isn’t it? I left clean MATCHING clothes for each day. Because, I’m a good mom. I left detailed lists of chores broken down by age/ person and day. Truthfully? I just hoped someone would mop up the toilet misses before I got home. I should have included emergency cleaning instructions. Like for cat vomit and cheerios and mashed banana. I also left a list of do’s and don’ts. Do bathe. Don’t do it in mud. Don’t let the children kill each other or harm the cats…. You know- simple stuff, like that. Year after year, I went to MOPS convention, and left feeling refreshed by fun and connection. I was reminded of being a part of something even bigger than our local group. I was reminded that I am incredible and unique, and called….I also worried about my families managing without me. I worried if they were eating. I worried if they could read my instructions on the casseroles….I worried about the cats. I worried about the morning they went to church without me… (umm matching clothing at church is important.. It’s kind of like visible holiness…rt?) I worried about what they were into and if they went into public restrooms alone. Year after year, I returned hone, exhausted but refreshed. Year after year I was met at the airport by a family on the verge of collapse and in some pretty interesting outfits. It took days for me to clean up all the messes that went ignored while I was gone. It took days to get discipline back on track. Honestly, It took days for me to look at my husband without wondering how he managed to function at work if he couldn’t read. (I doubted his literacy- because duh! I’d written it all down!) It took days to catch up on laundry. (Ok I’ve NEVER actually caught up my laundry… I gave that up.) For years, I got angry that things weren’t done MY way, while I was away. That appearance of near collapse at the airport? It comes from having fun, not neglect. Who knew? Matching clothes have nothing to do with holiness. And the church ladies just smile at daddy’s attempts to dress children for church… they don’t write you off as a bad mom. well- some may but those are cranky ladies with too many cats.. just sayin. No one will eat the casseroles, don’t bother. Velveeta Shells and cheese and banquet chicken can be bought at the party store, hence avoiding the grocery. Men are crafty like that. It still counts as dinner. Cat vomit is easier to clean up when it’s dry. My children are way more resilient than I thought. Husbands may think that letting the kids wear dirty(ish) clothes is actually HELPNG. It saves you laundry when you get home. Thank them for being considerate. If you gripe about how things are (or are not) done when your gone… you can expect even less the next time you go. His way is the RIGHT way, when you’re not there. Deal with it. Here’s the thing, we can either go to Convention and be distracted by our controlling nature (hey- we’re moms, we can admit it.) and return home angry about all that went undone, or done wrong… or we can go to convention, count the messes and mayhem we find on arriving home, as part of the cost, and be glad we went. After 20 years? I choose the latter. I’ve also learned what’s important and I don’t knock myself out over what’s not. This makes it easier for me to leave (I save hours not bothering with frozen meals) and less frustrating when I come home. I make sure there IS clean laundry, but understand they will wear what they want while I’m gone. (And it doesn’t really matter.) Our lists of what’s important may differ, and your childcare arrangements may need different instructions… but we all need to learn what to hold onto and what to let go of to make Convention a reality that isn’t a nightmare…. What works and what doesn’t, for your family? Lists? Casseroles? Outfits laid out? (during the school year, I put them in gallon ziplocks arranged by day…. I’m like that) Or McDonald’s and dirty clothes because they’re “saving you work” by wearing them twice? In answer to my title question: YES. For the record, I technically, did not steal Gumby. I may have suggested that he was within reach and unattended.. but I myself did not steal Gumby. 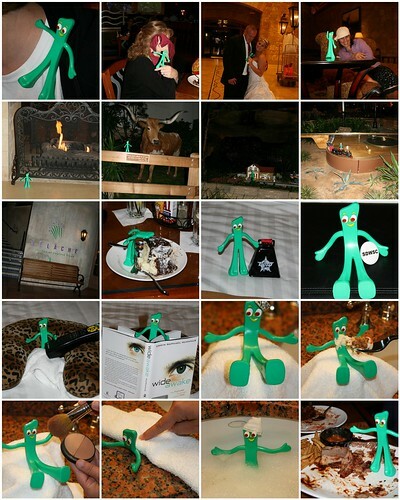 Gumby met a beautiful bride and handsome groom. Gumby relaxed in the hotel lobby near the fireplace. Gumby met a steer. (He also climbed on the fence around the steer that was clearly labeled “DO NOT CLIMB OR STAND ON THIS FENCE) Apparently Gumby is a rebel. Gumby found a train that was irresistible, he had to ride it, and even found a little house that was JUST his size! Gumby brought out my jealous side- by going to the spa. He had a hot tub, a massage, and a makeover. I wanted to pinch that little guy when he kept eating cheesecake and carrot cake without blowing up like the Pillsbury Dough Boy. I would have gained a pants size, maybe 2! Gumby also bought a cowbell and stuffed it into my suitcase for my youngest son. I can assure you- waking up to a cowbell rung 3 inches from your left ear is NOT a pleasant experience. Gumby kept asking what SDWSC meant.. now he knows. Gumby watched the season kick off of Pushing Daisies.. I missed it. Gumby was touched by Erwin McManus’ new book “Wide Awake” as was I. That little bugger even stole my wedding ring to wear as a crown…cause he was feeling like a prince for a day! No worries- I got it back, I’m bigger than Gumby. Oh and Gumby wants the world to know- Texan BBQ? ROCKS. Finally- Gumby was hand delivered to his caretaker and bestfriend, by a Gaylord Resort Staff member (who got a very nice tip, I might add)at which point, I might have been rolling on the hallway floor, laughing so hard, that the pictures from his safe return are blurred. No Gumbys or Field Leaders were harmed in the taking of these pictures. Also- Due to confidentiality- I cannot disclose who else was involved in the Gumby disturbance- suffice to say, I was not alone. MOPS International Convention preparation: It’s all fun and games until a bra explodes…. Bad things happen when I’m in a rush. I KNOW this. I should have learned from a series of rush- induced incidents I’ve already endured. (The great brownie wound of Christmas, 2004 was a classic and painful lesson) Apparently, I haven’t quite caught on. Because yesterday I learned it anew. 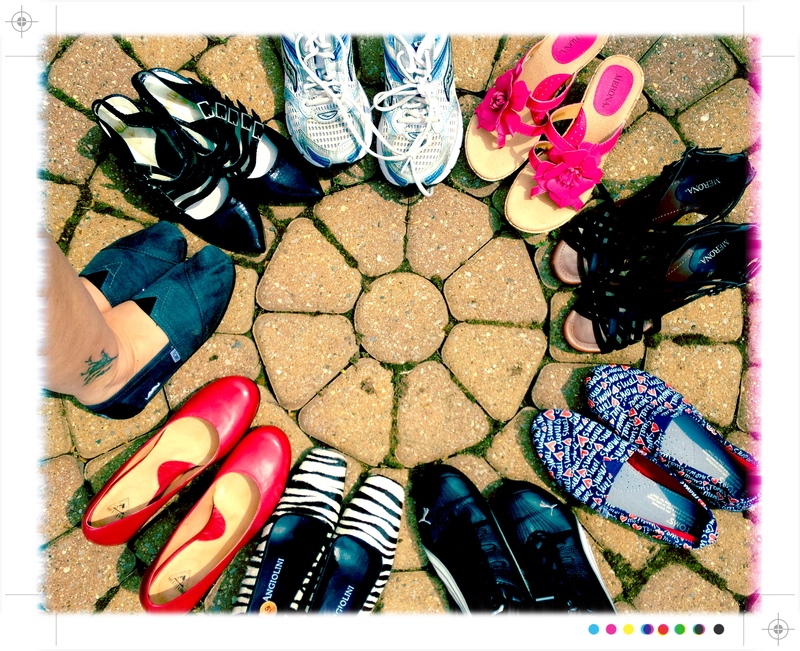 I’d been packing and cleaning and emailing, printing and prepping all day to leave for MOPS Convention.…. I looked at the clock I realized, that if I didn’t get dressed immediately- I’d be driving the college boy to class in my jammies.. since his class starts at 6:00 p.m. That wasn’t an option I (Nor he-) wanted to take. I ran upstairs, tore off my jammies and grabbed a bra- it’s a crazy, criss-cross backed bionic model (obviously designed by a man) – I have to put my head through it, then wiggle around until I get it on right.. finally fastening it in the back. (A feat of circus performer talent.) I admit- It’s a bit too much for “in a rush dressing” but, it was the only one I could find. (On my bedroom floor- hmmm I better clean that up before I leave- who am I kidding? if i clean it up it will get dirty before I come home- I’ll leave it.) Again: I should have known better. Mid- wiggle- I heard what could be described as a whip-cracking sound and then felt a sharp sting on my right cheek. “Wha?” I grabbed my cheek- and checked for blood. Whew. None. I looked for sling-shot pellets meant for a raccoon. (My son The College Boy seems to believe it’s his job to rid the neighborhood of vermin) Nada. I looked around for a swarm of bees..attacking me in my underwear.. nothing. I looked for a rogue 6 year old with a bull whip (as a mom of boys- I check for anything) . Nope. It took me a full minute to realize I hadn’t been shot at or whipped or stung while standing in my underwear in my own bathroom. I suddenly noticed that one breast felt very– ummmmm “free”. That’s when I realized the bra strap had snapped,and had smacked me in the cheek. Looks like this trip is gonna be an ADVENTURE! 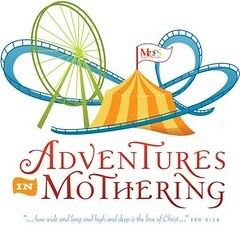 Make sure and stop by the MOPS Convention Blog to see what happens as thousands of Moms take over Dallas! Shemergency kit– cause it should have everything I may have forgotten- Check. My To Do list is shrinking – and my excitement is growing … I wonder what it will be like? I wonder what God will say to my heart while I’m there? I wonder what weird things my hair will do in the Dallas heat? I wonder how much laundry will accumulate in my 5 day absense? I wonder how my 4 guys will survive on Banquet Chicken and Velveeta Shells and cheese, and pizza carry-out? I’m about to find out all the answers in T-minus 20 hours… the final countdown has begun! BIG NEWS! I’ve been asked to “live blog” from the convention- so if you want to know the scoop and see what MOPS convention is really like- make sure and watch the MOPS International Convention Blog for updates! Dear Lord- I pray that you’d prepare my heart and the hearts of the thousands of Moms who are preparing to come and be refreshed and challenged at MOPS Convention- I pray that you’d be with the MOPS Leadership team- the speakers and families– Most of all- I pray we see you in everything at convention- I love you lord- amen.